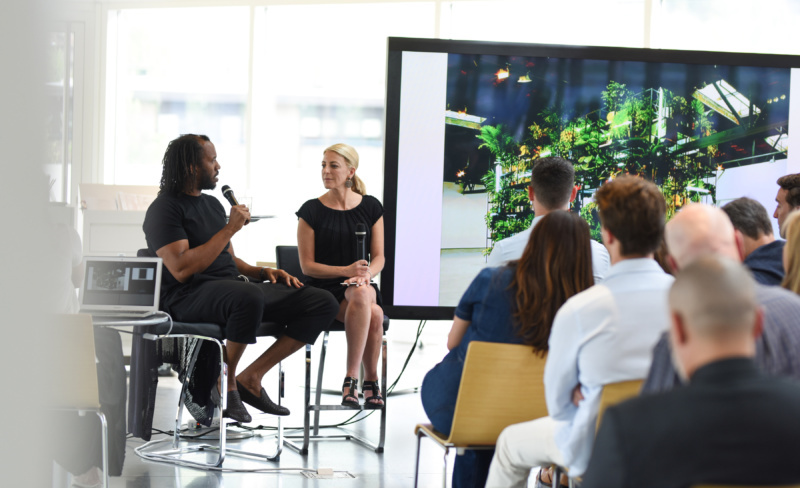 Amy Phelan, Heidi Zuckerman and Rashid Johnson at the Annual Aspen ArtCrush 2018. Throughout his career, Johnson has constructed nuanced and evocative narratives on blackness by incorporating photography, painting, sculpture and installation in his unique practice. Johnson’s universe is immersive and visually abundant. Items like black soap and shea butter often appear; handmade ceramic planter pots feature vivid abstract compositions; and mundane objects like colored tiles and crushed mirror shards add a cool dimension to his collages. Literature and performative elements are fundamental as well. In his recent exhibit “The Rainbow Sign,” at the David Kordansky Gallery in Los Angeles, the show’s title came from James Baldwin’s The Fire Next Time, which was inspired by lyrics from the spiritual Mary Don’t You Weep. In the show, neat stacks of Paul Beatty’s novel The Sellout were thoughtfully embedded in the work Untitled Microphone Sculpture, and Johnson invited acclaimed poet and playwright Ntozake Shange to read a poem during the opening. Johnson and Zuckerman in conversation at the Aspen Art Museum, 2018. For his upcoming 2019 show at the Aspen Art Museum, the performative element shifts to choreography. Johnson explains, “This one is going to be a collaboration, something around ballet and movement. Right now, there is something really fascinating around black bodies moving in space. What is the agency that one has to move? How does that function on an institutional level, with a poetic connotation, and with the kind of antecedent in history that dance provides from the idea of movement.” Zuckerman, who will oversee the exhibit, adds, “He’s been talking to some choreographers who have a traditional ballet background, and he’s feeding them text that he feels are like the breadcrumbs to his consciousness or his psyche. He’s talking about W.E.B. Dubois and a variety of other text sources and he’s asking them to think about ballet trough these different source materials. And having them activate rugs that he’s going to commission in Mexico with cartography that he’s inventing.” The Aspen Art Museum will enter a special partnership with the Museo Tamayo in Mexico City, where the video will be shown, and its senior curator Manuela Moscoso will help commission the rug weavers. We can also expect Johnson’s upcoming 2019 film debut of Native Son, a creative union with playwright and screenwriter Suzan-Lori Parks based on the seminal Richard Wright novel from the 1940s. The film’s cast includes Ashton Sanders (Moonlight), Margaret Qualley, Lamar Johnson and Jerrod Hays. Johnson explains: “It’s a different kind of protagonist and a contemporary basing of the story that’s incredibly complicated, so it’s going to be really interesting to see how people respond. To be able to take a story and build from Wright’s narrative, and expand into how I think about some of what he would do and say, in the times that we live in, was a huge responsibility that I took very seriously. I hope I make something that’s valued in the culture.” Yes you will Mr. Johnson, and we will be watching and waiting.